The 2017 American Society of Clinical Oncology (ASCO) Annual Meeting were taking place June 2–6 in Chicago. At ASCO, Lia Gore, MD, co-director of the Hematological Malignancies Program at the University of Colorado Cancer Center and pediatric oncologist at Children’s Hospital Colorado, presented exciting data about Dasatinib in pediatric CML patients: CML in children is ultra-rare, making it very difficult to study - CML cases make up only 3% of all leukemias in children. The data presented here has been submitted to FDA and EMA for the approval in pediatric use, and is quite impressive: The side effect profile seems to be very favourable and the inhibition of bone growth in children on TKIs seems to be less of an issue in Dasatinib than in Imatinib. However, given that administration of medicines in children and being adherent to therapy is often a challenge for young CML patients (and their parents), the availability of Dasatinib also as a powder-based suspension as well as the fact that the drug can be taken without or with food may make life much easier. 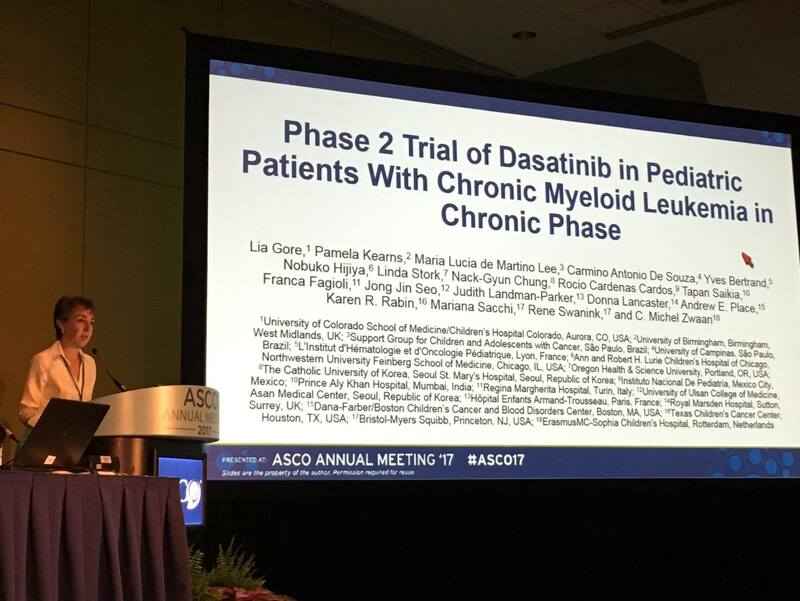 The investigators concluded that Dasatinib may be considered as a new standard of care for pediatric CML patients. CML Horizons 2017 - Learn. Share. Grow: Presentations, Photo Gallery and Web streams now available! CML Advocacy: Learn. Share. Grow. During the annual CML Horizons Conference on 26 to 28 May 2017 the CML Advocates Network welcomed 100 delegates (among them 24 newcomers) supporting patients and families affected by Chronic Myeloid Leukemia (CML) to Frankfurt, Germany. Delegates from around the world (Europe, North America, Asia, Africa, Middle East and Latin America) came to Frankfurt to learn from experts both medical and patient advocates on the latest information about CML, share best practises in patient advocacy in order to grow their organisations in their own countries and give back to their own communities. We also featured a poster board where our members were able to present some of their activities that they have had during the year. In addition to this our members had the opportunity to submit abstracts and feature in our “best Practice session” on a successful activity they had on their own country. Furthermore, at this year's conference a new CML Horizons Steering Committee was elected. CML Horizons is a wholly community-run and multi-sponsored conference, which has evolved from the "New Horizons" conferences 2002-2011. The annual conference is run by the CML Advocates Network, hosted by the non-profit, swiss-based and patient-driven "Leukemia Patient Advocates Foundation". Presentations, Photo Gallery and Videostreams are available now! Click on "PDF" to see all presentations. If you wish to translate selected presentation, please contact Celia Marín at and ask for the PowerPoint-file! This will make it easier for you to translate the presentation to the language of your choice. Please note that the speakers have authorized CML Advocates Network only to provide the PDFs on this website, but it is not allowed to upload the PDFs somewhere else! So if you want to share the slides, please do this by linking to this page or the files on this site! To stream individual sessions, click on "Webstream" below. The 2017 American Society of Clinical Oncology (ASCO) Annual Meeting is taking place June 2–6 in Chicago. At the CML Education Session, CML expert Dr. Ehab Atallah, MD, associate professor of medicine in the division of hematology and oncology at the Medical College of Wisconsin, has been speaking during an Education Session about discontinuation of tyrosine kinase inhibitors in chronic myeloid leukemia (CML) presenting about the "Promise of stopping TKIs: Is it ready for prime time"? Even though no new data was presented (see ASH 2016 Report), it has been very interesting to listen to the US perspective. We are proud to welcome a new member organisation to the CML Advocates Network: Philadelphia LMC based in Algeria. The CML Advocates Network now totals at 115 member organisations in 86 countries worldwide! See the list of CML groups in the Network on our world map. Not many weeks left until the European Hematology Association's annual congress opens its doors in Madrid, Spain. We are excited to see many of you at #EHA22 2017! Over the past months, we've been working hard with the EHA team to set up an attractive patient advocacy programme during the congress. We have a joint booth of all European patient advocacy organisations, and once again also having a “Patient Advocacy Track” within the scientific program during the congress. Up to 50 free congress registrations were offered to patient advocates, so we hope there will be strong patient attendance! Click on "Read more" what is offered specifically for patient advocates, hematologists and other stakeholders at EHA this year. 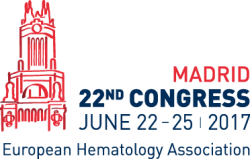 This year EHA Congress will be held on the 22-25 June 2017 in Madrid, Spain. Thanks to very patient-centric thinking, EHA continues to work closely with the patient community and is once again offering a “Patient Advocacy Track” within the scientific program. EHA FELLOWSHIP -- APPLY NOW, UNTIL 29 APRIL! Once again in 2017, EHA will provide 50 Fellowships for their EHA congress which will be held during the 22-25 June 2017 in Madrid. The Fellowship provides free access to the full congress, but also includes a compulsory "capacity building programme" to educate all attending advocates and further their development and knowledge about haematology and science. In collaboration with EHA and the European Reference Network EuroBloodNet, we're taking the next level this year and will provide a "EHA Capacity Building Meeting" for all Fellows on 22 June, from 14:00 - 17:00. In this meeting, EHA Fellows will hear about EuroBloodNet, the ePAGs, about interpreting scientific data, and about how to get the best out of a scientific conference EHA (for all disease areas). This will then be followed with a summary of the most important data presented at EHA, specifically for Fellows in MDS, Myeloma, Acute Leukemias, Lymphomas & CLL, MDS and CML. The capacity building meeting on 22 June will be mandatory for all EHA Fellows. Priority will be given to advocates who have attended last year's capacity building event and/or are engaged in European hematology patient networks. Please encourage your most important science-interested advocates to apply for an EHA Fellowship to attend EHA and speak to your umbrella group if they may be able to support EHA Fellows with travel costs. The CML Advocates Network can provide a limited amount of travel grant of up to 500 EUR to those European CML Advocates that receive a fellowship. Deadline for applications is 29 April 2017, accepted advocates will be informed in the first week of May. We are looking forward to meeting all the haematology advocates in Madrid! Non-Adherence to treatment in chronic diseases is a well-known problem. 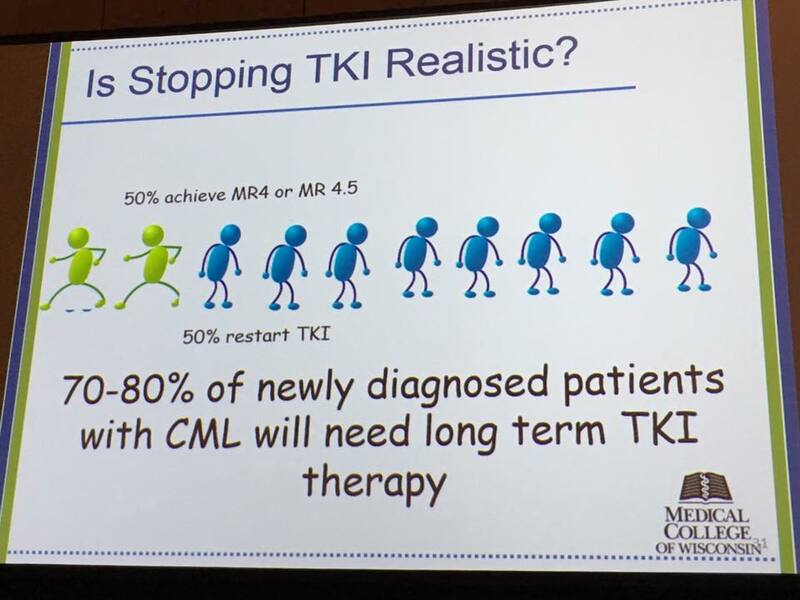 The dramatic evolution in CML treatment in the last decade, resulting from the introduction of Imatinib and followed by second generation TKIs, has turned CML into a kind of chronic disease where patients need to take their medication on daily basis. In 2012, the CML Advocates Network decided to conduct a large, scientifically sound international study on adherence. It enrolled patients from 9/2012 to 1/2013 based on a comprehensive questionnaire in 12 languages. The aim of this study was to investigate motivations and behavioral patterns of adherence in CML and subsequently support hematologists and patients to improve adherence and develop suitable adherence tools. Overall 2.546 questionnaires filled in by CML patients from 63 countries and 79 CML patient organisations were returned. Our publication “Factors influencing adherence in CML and ways to improvement: Results of a patient-driven survey of 2546 patients in 63 countries” has been a tough ride for us non-scientists over the past three years, given we needed support to do the data analysis and write a scientific paper. THE EUPATI PATIENT EXPERT TRAINING COURSE IS TAILORED TO PATIENT ADVOCATES AND TURNS THEM INTO PATIENT EXPERTS IN MEDICINES RESEARCH AND DEVELOPMENT. The EUPATI Patient Expert Training Course in Medicines Research & Development is an exciting and unique opportunity, offering patient advocates expert-level training that is specifically tailored for them. This 14-month tailor-made course, based on e-learning with additional two face-to-face training weeks, gives you the tools as CML patient advocate leaders to be able to contribute to be part of the research and development process and all related regulatory processes. It helps to understand all processes of pre-clinical and clinical research, drug safety, benefit/risk assessment and health technology assessment at an expert level. So far, three CML advocates members have participated in the EUPATI course: Conny Borowczak, Aimo Stromberg and Sarunas Narbutas. Read about Conny's experience by clicking on "Read more", and contact them if you have questions. Click on read more for Testimonial. The American Society of Hematology’s annual meeting brings together hematologists from around the world to discuss critical issues in hematology, examines the latest clinical advances in this area and explores the year's most significant scientific discoveries and updates. Jan Geissler, Co-founder of the CML Advocates Network and chair of the German leukemia patient platform Leukaemie-Online has been interviewed by the Video Journal of Hematological Oncology. during ASH 2016 on some of the hot topics at ASH 2016. We are happy to share with you these short video interviews that highlight a CML patient’s view on the safety of stopping treatment in Chronic Myeloid Leukemia, the new BCR-ABL inhibitor ABL001 for CML treatment, generic Imatinib in the age of Imatinib patent expiration, patient involvement in th ASH congress, as well as some European programs and initiatives in hematology like HARMONY and the European Reference Network EuroBloodNet. We are proud to welcome a new member organisation to the CML Advocates Network: CML Zimbabwe based in Zimbabwe. The CML Advocates Network now totals at 114 member organisations in 85 countries worldwide! See the list of CML groups in the Network on our world map. Hooray! Our publication of the CML Advocates Network's adherence survey has been accepted in the Journal of Cancer Research and Clinical Oncology. Our adherence study is one of the largest adherence studies made so far, with 2546 patients from 63 countries and 79 CML patient organisations and very important findings on the motivations and risk factors of patients on intentional and non-intentional non-adherence, potential tools to drive adherence. It is also a great example of evidence-based patient advocacy! This publication has been a tough ride for us non-scientists over the past three years, given we needed support to do the data analysis and write a scientific paper. Authors were the patient advocates Jan Geissler, Giora Sharf, Mina Daban, Jan de Jong, Tony Gavin, Jana Pelouchová, Euzebiusz Jan Dziwinski, plus Dr. Verena Hoffmann who has been the scientific author, supported by Prof. Joerg Hasford and! The news of acceptance for publication was received today, the paper will hopefully be in the public soon. EuroBloodNet European Reference Network starts with the hematology European Patient Advocacy Group (ePAG) - and CML Advocates Network is in! 24 European Reference Networks, based on an initiative of the European Commission and EU Member States, are networks of healthcare professionals, centres of expertise and patient organisations aimed at improving quality, safety, and access to highly specialised healthcare in Europe. 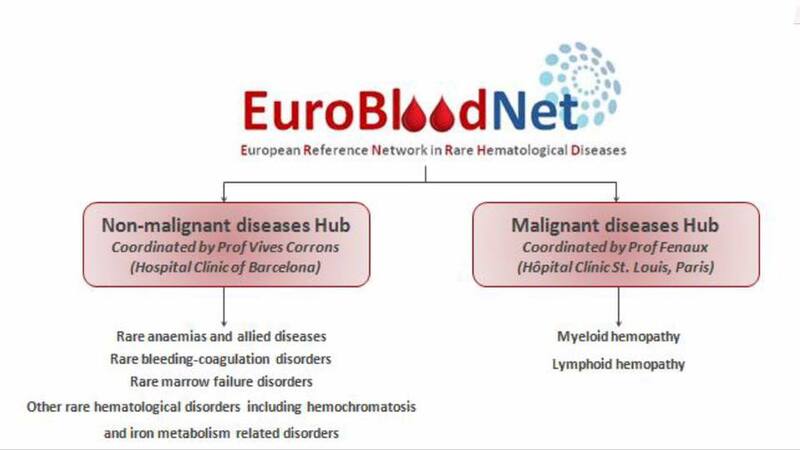 The EuroBloodNet European Reference Network, covering rare haematological diseases, has kicked off on 27 January 2017 in Paris with 66 partner organisations from 15 countries. The Leukemia Patient Advocates Foundation, CML Advocates Network and CLL Advocates Network are deeply involved in EuroBloodNet to make sure it delivers to patients' needs. Tomorrow is World CML Day 2016!